Cuba and Mexico share many characteristics. Historically, both were Spanish colonies and are now both post-revolutionary countries. Geographically, the countries are close neighbours within Latin America and they are situated next to the United States. While Mexico and the United States maintain friendly relations, relations between Cuba and the United States are severely strained. This fact alone exerts the greatest deal of influence on Mexico-Cuba commercial and diplomatic relations. The core principle of Mexico’s foreign policy is “non-intervention” in the affairs of other states. Mexico has stood by this principle regarding Cuba (Covarrubias, 1996). For instance, Mexico was the only Organization of American States (OAS) member not to break diplomatic ties with Cuba after the 1964 resolution to isolate Cuba. Mexico has also strongly protested the use of the Helms-Burton law to deter commercial relations with Cuba. By basing its relationship with Cuba on the principle of non-intervention, Mexico has maintained an amicable commercial and diplomatic involvement with the island, throughout the Castro regime. Although Cuba-Mexico bilateral trade has never been strong, it increased in the 1990s, until 1995. However, in 1996 and 1997, the value of Mexico’s exports to the island, especially in oil and related products, dropped significantly. Likewise, although Mexican companies participated in some important joint ventures on the island in the early 1990s, they are not currently playing a large investment role in Cuba. The first section of this study will review Mexican- Cuban relations from the Cuban revolution to the end of the 1980s. It will include an overview of the limited commercial history between Mexico and Cuba, until the breakup of the Soviet Bloc, an event which shook the economy of Cuba and forced the government to search for non-traditional commercial partners. The second section of the study will examine the impact on Mexico of Cuba’s re-orientation in the international sector. This section will also put into perspective the influence of the U.S. government on this relationship by examining negotiations between Mexico and the United States regarding the North American Free Trade Agreement (NAFTA), as well as the Mexican Peso Crisis and the implementation of the Helms-Burton Law. The third section of the study will document Mexican investment in Cuba, which reached a peak in the early 1990s. Finally, the paper will review the strategic advantages and disadvantages of Mexican companies exporting to the Cuban market. The research for this study included both secondary and primary sources. An extensive literature review of Mexican, Cuban and U.S. sources was conducted. This research was complemented by interviews conducted with Mexican government officials, academics and business professionals, during the Spring of 1998. Due to the sensitive nature of trade and investment with Cuba, very little statistical information was made available by either government or private sources. Although interviewed company names have been kept confidential, a list of government agencies interviewed is provided in the Appendix. The guidelines of international policy are few, clear and simple. They only proclaim: That all countries are equal; they should mutually and scrupulously respect institutions, their laws and their sovereignty; that no country should interfere in any manner and under any motive in the internal affairs of another. All should strictly and with no exception submit themselves to the universal principle of non-intervention (Mexico, SRE in Covarrubias, 1994 p. 51). In terms of commercial relations, there was little Mexico-Cuba bilateral trade between 1959 and 1973. Cuba’s involvement with the Soviet Bloc and its COMECON market meant that most of Cuba’s trading needs were fulfilled through special relations with these countries. A turn around in economic relations between Mexico and Cuba began during the government of Mexican president Echeverría (1970- 1976), which corresponded with an increase in interest between Mexico and Cuba for improved trade and cultural co-operation. For example, in 1974, two important joint agreements were signed, one regarding culture and education and the other regarding scientific and technical co-operation (Cornelis & Sierra, 1989 in Covarrubias,1994). During a visit to Cuba, in 1975, and throughout that year, the Echeverría and Castro governments signed several additional cultural and commercial treaties. These treaties covered areas as diverse as industrial and economical collaboration, collaboration in the sugar industry, and exchanges in television and radio broadcasting. Although trade began to increase in the 1970s, the numbers were still low in comparison with each country’s respective total trade figures. In other words, economic relations were not significant because both countries had more important trading partners in industrialized countries (Covarrubias, 1994). It was during the presidency of López Portillo (1976- 1982) that Cuba and Mexico shared their closest political relations (Covarrubias, 1994). Collaboration during this period was very strong and marked by rumors of unofficial loans to Cuba and trade in oil (Covarrubias, 1994), which had been strongly discouraged by the United States since the 1960s.4 Among the points of collaboration between Mexico and Cuba during the López Portillo presidency was the establishment of the General Intergovernmental Joint Commission in 1978. The Commission’s aim was to review work on all other commissions, treaties and groups and to propose methods or projects for the continued development of relations between Mexico and Cuba. De la Madrid’s presidency (1982- 1988) coincided with the collapse of the Soviet Bloc and a change in Mexico’s trade strategy to one of export promotion. During this presidency, the economic relationship between Mexico and Cuba continued to grow, but diplomatic relations began to cool. Two important factors under the de la Madrid presidency helped to streamline the trading process between Mexico and Cuba. First, a Limited Scope Agreement was signed in 1985, which finally allowed Mexico and Cuba to trade basic and manufactured products with reduced or zero tariffs (Covarrubias,1994). Second, lines of credit were established between the Mexican Bank for Foreign Trade (Bancomext) and the Cuban National Bank. By 1989, the collapse of the Soviet Bloc was almost complete and Cuba was once again alone and isolated without the traditional trade partners it had become accustomed to. While the countries of Eastern Europe changed their economies from within, Cuba was forced to reform its economy in response to external factors (ECLAC, 1997). The breakdown of the Soviet Bloc put an end to the Cuban system of guaranteed full-time employment and lack of concern over productivity. This period of 1989 to 1993 marked a decrease in Cuban GDP of more than 30% (ECLAC, 1997). The Cuban government’s response to this crisis included a search for alternative sources of trade and investment. The Salinas government (1988-1994) witnessed very complicated relations between Mexico and Cuba. While both countries were interested in Mexican investment in Cuba, Salinas was also strengthening ties to the United States. Although publicly stating that Mexico would help however possible to improve the situation in Cuba, in 1992 Salinas began meeting with members of the Cuban exile community in Miami (Covarrubias,1994). Around the same time, Salinas also received additional pressure during the NAFTA negotiations from members of the U.S. Senate, who sent him a letter expressing their concern about Mexico’s policy on Cuba (Epoca, 1992 in Covarrubias, 1994). Both actions were seen as pressure tactics to force the Salinas government into adopting a harder line on Cuba. The Zedillo government (1994-2000?) has weathered even more strain. His government was compelled to accept an aid package (with a series of political demands, reportedly, attached to it), from the U.S. government following the 1994 Peso Crisis. Not long afterwards, the Mexican government was once again forced to re-examine the importance of its commercial relationship with Cuba under the threat of the Helms-Burton legislation. The implementation of the Helms-Burton law by the United States government has been strongly opposed by Mexico. Like most other countries, the Mexican government is of the opinion that the extraterritorial nature of the Helms-Burton Law violates the basic principles of international law. The two main groups within the Mexican government opposing the Helms-Burton law—the Ministry of Foreign Affairs and the Ministry of Trade and Industrial Promotion—point out that the law violates NAFTA, as well as, Mexico’s foreign policy of non-intervention (Covarrubias, 1997). The Mexican Congress has also stated its opposition to the law and its solidarity with the people of Cuba (Covarrubias, 1997). During the August 1996 visit to Mexico of Stuart Einzenstat, U.S. Special Envoy for Cuba, the Mexican government stated that Mexico supports basic human rights, as well as the policies of passive relations between states, self-determination and non-intervention. In addition, at the 28th General Assembly of the OAS in June 1997, Mexico reaffirmed its position that open dialogue and communication with Cuba were better alternatives for change than isolation, embargoes and sanctions (SRE, 1998). In October of 1996, in expressing its intention to use all legal means possible to limit the effect of the Helms-Burton Law, the Mexican government enacted a foreign extraterritorial measures law. The law prohibits Mexican companies from obeying foreign legislation and may impose fines of up to $ 300,000 USD on Mexican companies or citizens. In addition, the law states that Mexican courts will not recognize any U.S. claims under Title III of the Helms-Burton Law. If a Mexican company is sued, it can counter sue the U.S. company in a Mexican court for the same amount of damages. If the U.S. company refuses to pay, the Mexican company could have a legal claim to the U.S. company’s assets in Mexico. Overall, the Zedillo government’s stance on Cuba has been a very divided one. While continuing its non-intervention policy in regards to Cuba, the PRI government has distanced itself from Castro. This cooling in diplomatic relations has been best illustrated in the cancellation of Castro’s proposed visit to Mexico in 1996 and statements made by President Zedillo that he will not defend antidemocratic governments (Covarrubias, 1997). Nonetheless, Mexico continues to support Cuba’s reintegration into the Americas and continues to work with Cuba on several joint economic commissions (CEPAL, 1997). For instance, in June 1998, the 10th session of the Joint Commission of the Intergovernmental Working Group on Economic and Industrial Collaboration met once again to review the general state of economic relations between the two countries. Mexican officials stated that considering the process of economic transformation occurring within Cuba, it was important that Mexico continue to strengthen economic and commercial relations with the island (SRE, 1998). The growth of Mexican foreign investment in Cuba was facilitated by a 1991 agreement between Bancomext (Mexican Bank for Foreign Trade) and the government of Cuba which allowed for non-traditional restructuring of Cuba’s debt. This agreement paved the way for Mexico-Cuba debt for equity swaps which financed several Mexican investments on the island. In these swaps, Bancomext gave credits to Mexican companies to invest in or trade with Cuba as a form of repaying Cuba’s debt to Mexico (CEPAL, 1995). One of the first Mexico-Cuba joint ventures initiatives joined Cubanacán (a Cuban tourism parastatal) and Mexican company DSC (Desarollo de Servicios Constructivos) to construct a 4-star hotel in Varadero, Cuba. The project was completed in 1991. DSC contributed $15 million USD with approved financing through Bancomext in a debt for equity swap (CEPAL, 1995). Shortly thereafter, in 1993, Grupo Danta of Monterrey formed a joint venture with Unión Textil of Cuba. The two entered into a 20-year contract and became partners in a new company, the International Textile Corporation. In this deal, Danta contributed capital for buying the raw materials and financing repairs while Unión Textil contributed the industrial capacity and qualified labour force. The Unión Textil had the use of 33 plants valued at $2.5 billion USD and 37, 000 workers (CEPAL, 1995). In another debt-equity swap, Cemex of Monterrey, the world’s third largest cement producer, joined with Unión de Empresas de Cemento to create Empresa Mixta Cementos Curazao NV (EMCC). The project was a 50-50 joint venture which allowed for the sale of a cement plant in Mariel, Cuba, to EMCC (Babún, 1997). Cemex was able to export cement from the Mariel plant and from Cuba’s other 5 plants. A victim of the Helms-Burton legislation, Cemex decided to sacrifice its operations in Cuba to protect larger interests (including 4 plants) in the United States. In May 1996, Cemex notified the U.S. government that it had withdrawn from its operations in Cuba. The notice was given just before Cemex’s top executive was to receive a warning from the U.S. government that he might be violating Helms-Burton (Cuba Net, 1996a). The Helms-Burton claim against Cemex was based, in part, on the fact that one of the plants Cemex was using in Cuba was believed to have been confiscated by the Cuban government from Lone Star Industries of Stamford, Connecticut (Cuba Net, 1996b). Perhaps one of the best known (and largest) joint ventures to this point between a Mexican company and Cuba began in 1994. Grupo Domos entered into a joint venture deal through a 55-year contract with EmtelCuba, the Cuban state enterprise that operates the telephone service. For $750 million USD, Domos bought a 49% stake in the newly formed company, ETECSA. Domos did not have substantial assets going into the deal but secured the transaction through help from Bancomext in the form of an equity swap of $300 million USD of Cuban debt (CEPAL, 1995). ETECSA planned to spend about $1.4 billion USD to modernize Cuba’s telecommunications infrastructure, with both partners contributing half the expenses. ETECSA’s goal was to expand Cuba’s telephone system from 2.5 lines/100 inhabitants to 20/100 by the year 2000. However, after the peso crisis in December of 1994, Domos began having problems contributing to its share of the investment (de Córdoba, 1996). In 1995, Domos was forced to divest 25% of its stock in ETECSA at lower than market value. The stock was sold to STET of Italy for $291 million USD (de Córdoba, 1996). Domos contributed $320 million USD of the planned investment and was left with 37% of ETECSA. By the end of 1996, ETECSA had installed 37,000 digital lines and 900 international output circuits. International calls skyrocketed from 400 calls to 60,000 a day (Tamayo, 1996). In August of 1996, Domos received a letter from the U.S. State Department giving it 45 days to end operations in Cuba (Moore, 1996). The president of Domos, Javier Garza Calderón, and several top executives were told to resign or to break off ties with Cuba or they and their families would not be allowed to enter the United States. Although Domos did not leave the island in response to Helms-Burton, the law did make it difficult for the company, which was already having financial difficulties, to secure the financing required to continue their Cuban operations. Late in 1996, Domos was forced to leave Cuba after it was unable to secure continued financing for the project. Interestingly, Domos was singled out by the Helms-Burton legislation even though ITT, which ran the phone system before repatriation, had never given any indication that it planned to sue Domos (Moore, 1996). In 1997, within the provisions of Helms-Burton, STET finalized an agreement with ITT to use its properties in Cuba for 10 years. The agreement released STET from Helms-Burton sanctions. In sum, planned joint ventures in the mid 1990s faced many challenges, especially in strategic areas, such as oil and gas. Any planned joint venture would, of course, face pressure from the U.S. government and would, to some degree, need Mexican government backing (at least financially) to be secure. As mentioned before, 1992 brought about new pressures for the Salinas government from the U.S. Senate and the Cuban exile community, both of which were strongly against foreign investment in Cuba. Additionally, Mexican companies received a harsh blow with the fall out from the 1994 Peso Crisis, which caused severe financing problems and sent interest rates in Mexico soaring. It is rumored that some members of the U.S. Congress tried to link the U.S. financial aid package after the peso crisis for a stricter policy on Cuba (La Jornada, 1995 in Covarrubias, 1997). So although many other countries found investing in Cuba “risky,” U.S. pressure on Mexico’s government combined with high interest rates, made continued or new investing in Cuba nearly impossible for Mexican companies. The barriers were even greater for Mexican state owned companies, such as Telmex and Pemex. These companies would have been natural complements to Cuban state-owned agencies attempting to remedy Cuba’s deficiencies in communications and petroleum. For a state-owned company, such as to Pemex, to form a joint venture in a strategic area such as petroleum, would surely have had a profound impact on Mexico-U.S. relations. A few Mexican companies are still involved in joint ventures on the island. For instance, Telecomunicaciones Internacionales de Mexico (TIMSA), is a partner, along with Cuban government operated UTISA and Sherritt International Communications, in Cubacel. Cubacel provides analog and digital cellular service on the island. TIMSA originally held 50% of Cubacel but in 1998, it sold 75% of its shares in Cubacel to Sherritt (Economic Eye on Cuba, 1998b). In addition, Mexico’s Banamex is involved in a project to process receivables and issue consumer credit and charge cards within Cuba (Economic Eye on Cuba, 1997). While strong financing is a great concern for most Mexican companies (interest rates above 20% are common in Mexico), as Mexico’s largest bank, Banamex has a definite advantage. Banamex has also signed an agreement with Banco Popular de Cuba (Popular Bank of Cuba) to facilitate wire transfers, and letters of credit between Mexico and Cuba (Wall Street Journal, 1998). Although Banamex appears to be enjoying its position in Cuba, most Mexican companies have found the barriers to investment in Cuba too great. By examining the survival of Banamex’s joint venture in Cuba, and the demise of those of Domos (due to financing complication) and Cemex (a large company with important interests in the U.S.), it can be surmised that Mexican companies can succeed in Cuban joint ventures if they are large, independent of the United States and have strong financing. Although investment has weakened, many Mexican companies are continuing to export to Cuba, filling the void for imported, and in some instances American- made, products. With its close location and historical ties and common language, Mexico is a natural trading partner for Cuba. Exports to Cuba have grown to the point that by 1997, Cuba had become the 6th most important destination for Mexican exports (CubaNews, 1997). Attracted by the largest population in the Caribbean and a steady stream of tourists, Mexican exporters have tapped into the growth markets within Cuba of telecommunication, construction, petroleum and consumer goods. Mexicans are exporting products such as souvenirs, spare parts for telephones, food, tourism inputs, primary materials, materials for specialized construction and petroleum. The top five product groups exported from Mexico to Cuba in 1997 were: (1) mineral fuels and oil, (2) soaps, (3) plastics, (4) machines and apparatus and (5) nuclear reactor components (see Table 1). Interestingly, exports of mineral fuels and oil, which were significant in 1995, dropped in 1996 and 1997, from exports of $141 million USD in 1995 to $31 million USD in 1997 (see Table 1). Another interesting fact is that nuclear reactor components have been among the top exports to Cuba for the last 3 years. Many Mexican exporters began trading with Cuba after being contacted by the Cuban government, through Bancomext. In some cases, Bancomext introduced exporters to Cuban representatives in Mexico, such as MERCO (Cuban trade officials). In the early 1990s, if a company was interested in exporting to Cuba, they would receive strong support from MERCO. MERCO was staffed by Cubans who promoted Cuban trading interests in Mexico. They would buy Mexican products from Mexican companies who were not ready to export and over time, they would teach companies how to export for themselves. Unfortunately for Mexican exporters, MERCO stopped operations in Mexico shortly after the peso crisis. Mexican exporters to Cuba interviewed for this study mention that another commercial challenge for them has been the change in Bancomext’s attitude toward trading with Cuba. Once very helpful, Bancomext now shows little interest in promoting trade and investment with Cuba, most likely due to its ties with the United States. Bancomext’s about-face vis-a-vis Cuba may explain, in part, the decrease in both investment and trade since 1995. For instance, while exports to the United States have increased over 40% and exports to Spain have risen 18% between 1995 and 1997, exports to Cuba have dropped over 26% during the same period (see Table 2). 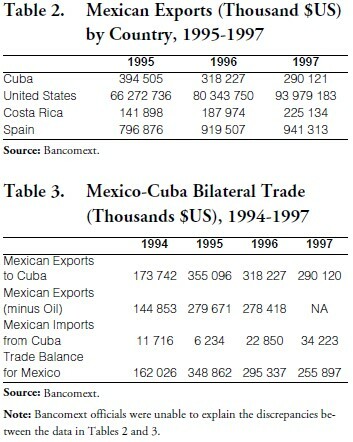 Despite the fact that Mexico has become one of Cuba’s top trading partners, exports to the island dropped in 1996 and 1997, as compared to 1995 (see Table 3). Another factor in Mexico’s diminished presence in the Cuban market is that competition in Cuba is fierce, especially in Mexico’s weakest area, financing. Several countries, including Italy, Spain and Panama, offer very attractive financing to Cuban importers, which the Mexicans cannot match. Mexican companies find it difficult to provide long term financing due to high interest rates in Mexico. Additionally, most Mexican companies do not have the capital necessary to wait 60 days for payment from the Cubans. While Mexican exporters find it difficult to compete on the basis of financing, Mexico’s competitive advantage is speed of delivery. Located only three days away by sea, Mexico can deliver a shipment to Cuba five times faster than European countries can. When a Cuban importer needs a product immediately, Mexico is the best option. Mexican companies, especially manufacturers who export to Cuba, can also compete on price. The Cuban market is still very price sensitive, so Mexican manufacturers that can offer a low price usually have an advantage. The lower cost of labour and shipping can also be factored into Mexican prices. Of course, the advantages for Mexican companies mentioned above are based on the fact that the U.S, embargo against Cuba provides Mexicans with a window of opportunity that will not exist if the embargo is lifted. Mexico has benefited greatly from the inability of Americans to service the Cuban market. However, many Mexican exporters mention that they will not be able to compete against American products and financing or the pull of Cuba’s closest market and potentially largest trading partner, the United States. While Mexico’s relationship with Cuba has been based on non-intervention, there has been great pressure on Mexico from the United States to limit diplomatic and economic relations with the island. Mexico has had to walk a tightrope with regards to its policy on Cuba: maintaining its anti-interventionist principles and defending its commercial sovereignty, while not endangering its relationship with the United States. It is in Mexico’s best interests to assert its support for non-intervention6 since its human rights records are also subject to assessment by the US and international organizations (Covarrubias, 1994). Prior to 1989, Mexico and Cuba favored industrialized countries as trading partners. However, trade and investment between Cuba and Mexico became significant after the fall of the Soviet Bloc, when Cuba began looking at alternative commercial partners. In the early 1990s, several Mexican companies began trading and investing in Cuba with the aid of Bancomext. This was Mexico’s “Golden Age” of investment in Cuba, with ventures in tourism, construction and telecommunications. However, the United States was able to exert pressure on the Mexican government during negotiation of NAFTA and, more importantly, with the relief package that followed the peso crisis. Sometime between the peso crisis and the enactment of the Helms-Burton law, Bancomext gave up much of its interest in Cuba, with detrimental consequences for Mexican interests in Cuba. Interest in trade with Cuba is continuing to grow. Many manufacturers, agents and other exporters have taken advantage of Mexico’s proximity to the Cuban market, low wages and their similar climates and common language. While export figures have dropped since 1995, the basket of products exported to Cuba has diversified. Mexicans face disadvantages in the Cuban market such as high domestic interest rates, unavailability of financing and lack of support from Bancomext. Nevertheless, Mexican companies continue to benefit from the absence of Americans in Cuba. The best opportunities for trade with Cuba belong to Mexican low cost manufacturers that can export directly to Cuba. These companies can tap Cuba’s cost-sensitive market and take advantage of relatively low transportation costs. With the lifting of the U.S. embargo, Mexican companies would lose some of their competitive edge in the Cuban market. While no one is certain what could be the outcome of open U.S. trade with Cuba, one thing is sure: there will be a sharp increase in competition. Future prospects for Mexican companies interested in investing in Cuba, after the lifting of the embargo, could include using their knowledge of the Cuban market and low cost manufacturing capabilities to form strategic alliances with American companies. Mexican service providers could also leverage their knowledge of the Cuban market in postembargo bidding for international aid projects. Of course, for Mexican exporters, any future improvement in the Cuban economy will increase potential exports to the country. In conclusion, Mexican companies interested in Cuba are faced with a difficult decision: either make their move now while they still maintain their competitive advantage or wait and plan a way to integrate their strategies with those of powerful U.S. companies once the embargo is lifted. 1. Tsoutouras would like to thank St. Mary’s University for generous financial support to be able to present this paper at the Eighth Annual meeting of the Association for the Study of the Cuban Economy. 2. Mexican Presidents Echeverría and López Portillo strongly and openly supported diplomatic relations with Cuba (Covarrubias, 1994 p. 327). 3. There have been reports of Cuba’s involvement in the 1968 clash between student and police, which began on July 26th at a rally celebrating the Cuban Revolution in Mexico City. 4. Since there was extensive U.S.-Mexican trade in oil products, there was a threat for the Mexican government if they exported oil to Cuba. 5. 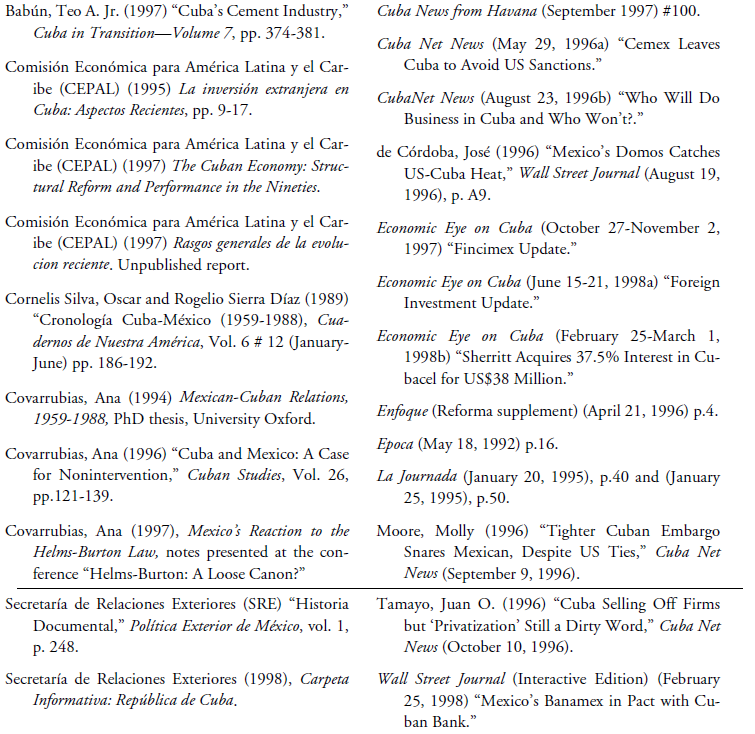 In the early 1990s Mexico was listed as a main investor in Cuba (CEPAL, 1995) but by 1998 (Economic Eye on Cuba, 1998a) Mexico was listed as a minor investor. Although actual foreign investment figures in Cuba are difficult to obtain, the June 15-21, 1998 edition of Economic Eye on Cuba, reports that France, Spain, UK and Italy make up 50% of investment in Cuba, Canada makes up 20% and Mexico, Venezuela, Argentina and Chile make up 18%. 6. A recent example of Mexico itself being a victim of U.S. intervention is the recent banking scandal, where the U.S. government conducted an undercover investigation of Mexico’s banks and money laundering without the Mexican government’s consent or knowledge.